Sport Wellington with the support of KiwiSport funding has played a key role in the success of creating opportunities for Secondary Schools to take up AFL New Zealand programmes within the Wellington region. Before commencement of the project, Secondary Schools approached AFL New Zealand to discuss the requirements, outcomes, elements of delivery and programmes that would happen within each school. Resource kits purchased by the schools to ensure they can continue with AFL after the completion of the project. With an increased focus on Female participation, Wellington Girls College took up the opportunity to have ‘Introduction to AFL’ and ‘House Rules’ delivered within the School for the first time. Introduction to AFL teaches AFL skills and uses modified games to reach the end product of playing a full game of AFL. The programme can be combined with junior class units of work, linked to curriculum programmes and lead into competition programmes. The AFL House Rules Programme focuses on providing students with easy access to participate in the new and dynamic sport of AFL. The competition takes place at a venue determined by your school, most often within your own school grounds. This alleviates travel costs for the school and the participants and more importantly provides opportunities to more students beyond the elite school representative teams. The format is a perfect for competition between classes or houses and can be played by boys, girls or in a mixed format that utilises touch, tag or tackle modifications. It’s a new fun way to get more kids, more active, more often and improve the skills of Kick, Catch, Pass and Bounce at the same time. AFL House Rules can be combined with a number of other AFL NZ Secondary School programmes to involve coordination by fellow students and curriculum based activities or as a selection trial for your AFL Cup team. The “Teachers versus Students” Clash is a great way to finish this fun programme. Delivery with Wellington Girls College was a success with over 300 girls involved in Introduction to AFL and 50 students involved in the House Rules programme. Over the entire project, AFL New Zealand delivered the Introduction to AFL to over 3900 junior Students from 9 Secondary Schools (Aotea College, Tawa College, Porirua College, Onslow College, Hutt Valley High School, Rongotai College, Heretaunga, St Patrick’s College, Wellington Girls College) with 150 of those taught by their Senior Students through the Coach the Coaches programme. 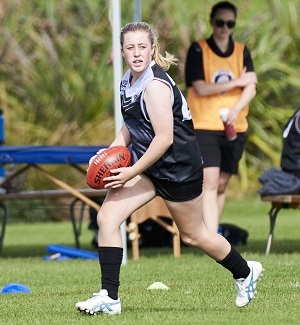 Onslow College student Sydney Gill is the first female from Wellington to represent the New Zealand Kahu Youth Girls. The highlight coming in Term 2 at the Upper Valley Cluster KiwiKick Tournament where 12 Upper Hutt College Students who completed the AFL Secondary Schools ‘Coach the Coaches Programme’ were on hand to assist with the tournament. Upper Hutt College teacher Scott Leggatt was fantastic in seeing the opportunity to link with local Primary Schools. Over the course of the day the students assisted with all aspects of running a tournament. From Umpiring and scoring games to recording results and coaching fun games during the bye rounds. The feedback from the Primary School staff (Maoribank School, Pinehaven School, St Josephs’ School, Silverstream School, Totara Park School, Fraser Crescent School, Trentham School, Oxford Crescent School, Mangaroa School, Plateau School and Birchville School) was positive and were impressed by the professionalism shown by the Upper Hutt College students. The AFL New Zealand Youth competition is into its third season in Wellington and was created to compliment the pathway for participants to excel in AFL. Within the AFL New Zealand Youth competition there is a focus on improving athletes’ skills and fitness along with a training, game and development programme that highlights the necessary requirements throughout the pathway. The 2017 Youth competition saw participants from 13 schools with 5 girls attending Wellington Girls College who were participating for the first time. Further opportunities exist for participants to be selected in the AFL New Zealand Academy which focuses on improving the skills and fitness of athletes through use of a training and development programme. From the AFL New Zealand Academy, the next step is the selection process for National Representative teams who play touring Australian sides in Wellington over ANZAC weekend annually. Onslow College student Sydney Gill made history in 2017 becoming the first female from the Wellington region to represent the New Zealand Kahu Youth Girls as they became the first ever AFL New Zealand representative side to win a series over an Australian opposition. If you would like to find out more about how your school can be involved in the project you can contact Mick Coultard, AFL New Zealand Youth Development Manager on mick.coultard@aflnz.co.nz or 09 213 3251.